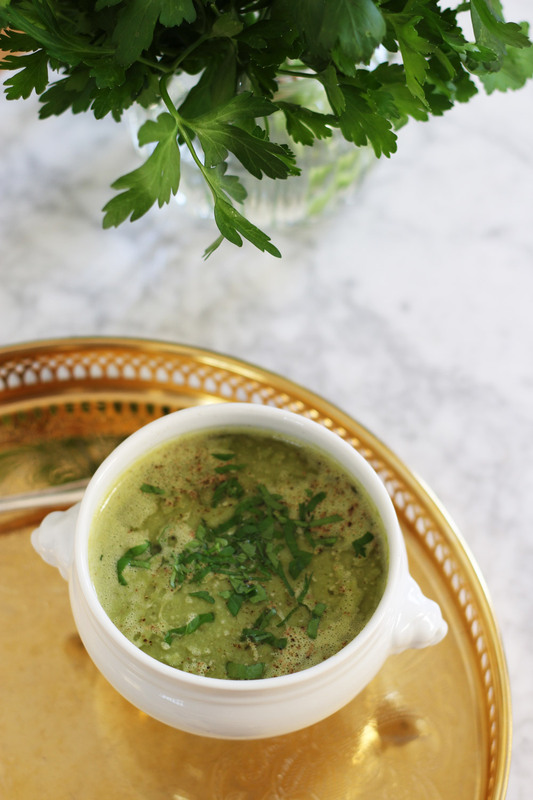 This is a herby and light soup, to enjoy either as a light supper or as a starter. This is the type of light, but nutrient packed soups that I enjoy as a dinner. Since I personally want to eat the heavier meals only in the beginning or middle of the day, when I need the energy. TIP: If you want a thicker soup, use less water. Fry onion and garlic in oliv oil until tender. Add the frozen peas, celery and white wine. Stir. Add the warm water and the vegetable stock cube and dried herbs. Bring to boil. Then let the soup simmer gently on medium heat under a lid for approx 20 minutes. Remove the bay leaf, add vegan cream and mix the soup even with a hand blender. Taste with salt, pepper and lemon juice. Serve with fresh, chopped parsley and a virgin olive oil on top. Want to luxe it up? Dress it with truffle oil prior to serving. Strain the soup prior to serving for an ultra smooth experience. Add 0,5 dl champagne (or prosecco) on top of each bowl, prior to serving.